Live the life of an influential merchant or a dreaded pirate in the Caribbean during the Golden Age of Piracy. Here’s just the right mix of complexity, theme, fun and strategy required for the perfect pirate game. 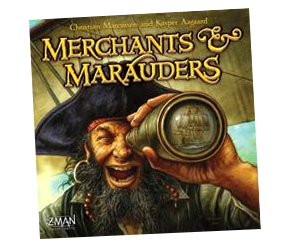 Games of Merchants and Marauders can be quite long, but you’ll be so immersed in the theme that you won’t notice. Buying and selling cargoes, evading and fighting pirates and naval vessels, plundering merchant ships, claiming missions and following up rumours are the main meat of the game; mix in a wide variety of very thematic cards and you’ll swiftly encounter some classic pirate moments. At one stage my opponent’s ship was slipping through the fog off Basse-Terre, just managing to avoid the pirate ship that lurked in those waters; at another time he was desperately fending off a pirate attack that was shooting his ship to splinters; in the meantime I took a safer route, upgraded my sloop to a galleon and delivered goods in demand between Havana and Santa Domingo. War broke out between France and England and I took a French merchant vessel off Cartagena; but my opponent reached his home port and stashed gold to reap glory points enough for the win! Time flew by, there was always something interesting to do. If you’re at all a pirate fan, you’ll enjoy this excellent game. Lots of options, variety, plastic pirate ships, combat, trade, naval vessels; even 3D cardboard chests in which to stash your gold. Arrrrrrr! This rules summary and reference includes the modular rules from the expansion Seas of Glory. The Merchants and Marauders page is coming up with a page error script. Just wanted to let you know. This place looks great. I’ll make a donation for the new files I picked up shortly. Error fixed matey! And thanks to ye! Thanks for the excellent summary!. I was just curious if you got the expansion (Seas of Glory) and if so whether an updated summary is in the pipeline? I haven’t got the expansion yet (my core set is in storage) but updating my summary is on the list – I’m just not sure when I’ll get around to it! Sorry to resurrect an old thread, but any chance of an update with the Seas of Glory expansion? I love your work and find myself not wanting to play games anymore unless i have one of your reference sheets! Thank so much for making gaming better!!! I have since bought the expansion, and updating this summary is definitely on the To Do list. I better hurry it along so you can play! 🙂 Thanks for the kind words. Believe me, the greater appreciation is on my side, thank you again for all your hard work and the quick reply. Can you double-check page seven? I think Basse-Terre allows french captains to reroll scouting, not seamanship. Thanks for all your awesome work!